Disclosure: The yarn used to create these projects was sent to me by the Manufacturer. I recently saw this stitch pattern used in a book to make a sweater. It was worked back and forth in rows but I of course wanted to make something in rounds instead. I love making hats! So I reworked it a bit and I came up with this fun and textured hat design. The stitch pattern is worked on a multiple of 6 stitches. 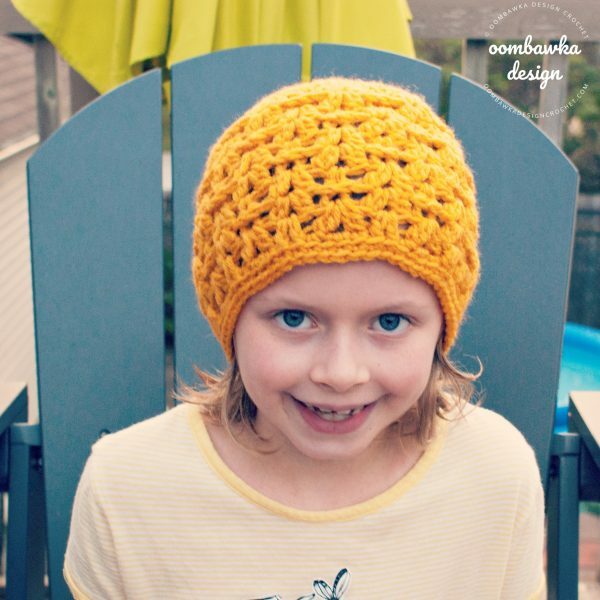 Shown below is a photo of Darla wearing the Gold Delight Hat in the child 6-10 year size range and the Bright Stripe Delight Hat is featured further down the page in a Red Heart Super Saver Stripes yarn. The striped effect is vibrant and bold, while the solid color is more subtle and the stitches are the star of the show. 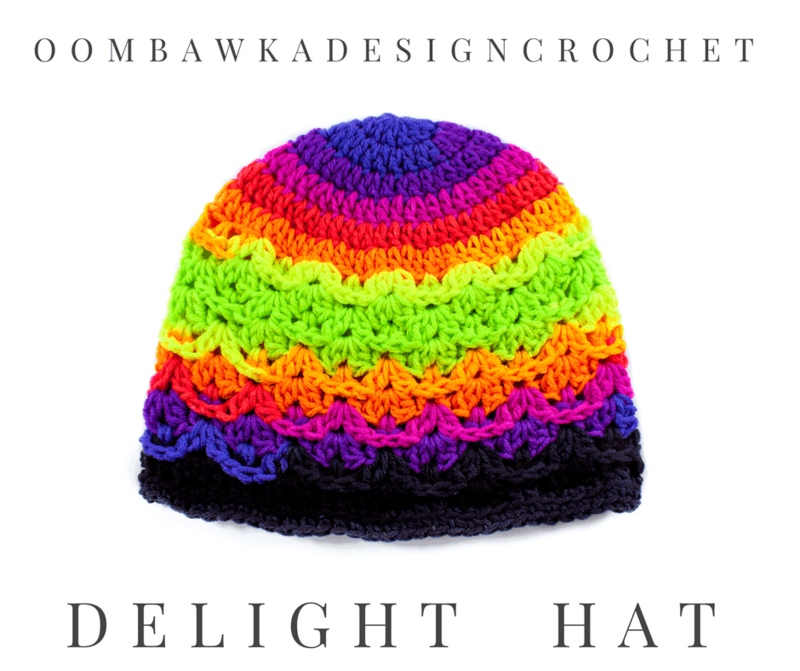 I think the Bright Stripe Delight Hat will make a great statement piece during the cold, gray and dreary winter months – plus the brighter the yarn colors the easier it is to find the person wearing it! 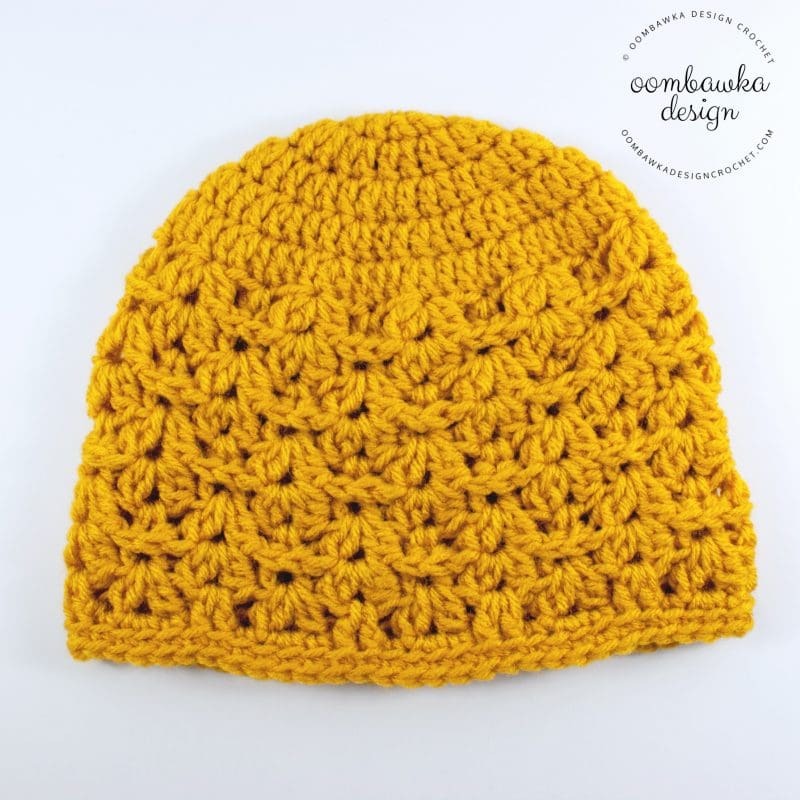 Since having my kids – I have become somewhat obsessed with making a few of their hats ‘easy-to-find’ in a crowd styles – and those are the ones I ask them to wear when we go on outings where there are a lot of people. I like to know where they are at all times! I hope you love this stitch pattern as much as I do! I think it is playful and fun and it is actually quite easy to crochet! The 2 dc-cl is the same as a dc2tog worked in a single stitch or space. *Yarn over the hook, insert the hook into the specified stitch or space, yarn over and pull up 1 loop, yarn over and pull through 2 loops on your hook**. Rep from * to ** one more time. Yarn over and pull through all remaining loops on your hook. The shell is created by working: (2 dc-cl, ch 2, 2 dc-cl). *Yarn over the hook, insert the hook into the specified stitch or space, yarn over and pull up 1 loop, yarn over and pull through 2 loops on your hook**. Rep from * to ** one more time. Yarn over and pull through all remaining loops on your hook. Chain 2. *Yarn over the hook, insert the hook into the specified stitch or space, yarn over and pull up 1 loop, yarn over and pull through 2 loops on your hook**. Rep from * to ** one more time. Yarn over and pull through all remaining loops on your hook. The shell is worked in one stitch or space. R16: Rep R12 but do not join with the sl st at the end of the round. I love this pattern, so quick and easy. I have already made about a dozen hats for charity and my daughter and daughter in law trying out the different color sets of striped yarn. I would like to know if I am reading the pattern correctly because I noticed that the child size has 4 rows of blsc and the adult size only has one. Just checking that it was intentional.